After a really nice day at the Big One yesterday, I woke up to blue skies, the sun shining and it was looking like being a lovely day, I just needed to catch a few fish now. I picked Janders up and we reached the venue in plenty of time, we were just going to collect some nets when we could see the Tart peering out the window of the shop, the window had bars on and allowed me for a few seconds to imagine him in prison, with a massive inmate behind him, asking him to pick the soap up! Alas unless wearing too much orange becomes a crime, I don’t think he’ll be doing any ‘hard’ time soon. There was a decent turnout of 18 with Scott Russell, fresh from his victory at Todber yesterday and Ads Palmer swelling the ranks. The match was on Sellicks and I was really looking forward to it as Jeff Sparkes had won the silvers match on Friday with over 18lb from peg 19. Adie got Janders to pick a golden peg which turned out to be 19 so there was a good chance it could go today. I fancied a peg on that side or at the top end but was really disappointed to find the number 2 on my ping pong ball. 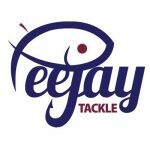 It used to be a great silvers peg but has gone off the boil in recent times, Jeff Sparkes was on 4 and was about as happy as I was. 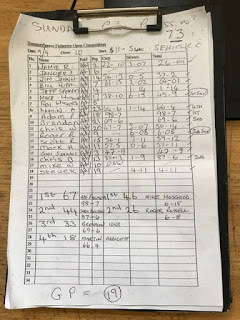 Steve Kedge was on the golden peg and said he would be going for silvers (so would pick up half the pot if he won), the Tart also drew spot on with peg 21 as did Exeter Mike on 17. Janders was on peg 6 so at least I’d be able to keep an eye on my side bet. The weather was glorious and I was sat there in a t-shirt although with it being flat calm, it wouldn’t do us any favours fishing for silvers. 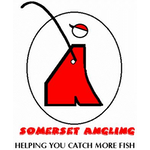 Chris Szakacs was on peg 3 and said he reads the blog, he is (along with Steve Burgess) one of the editors of the Bristol PSV Fishing Club blog. I set up a 0.4 gram Malman pencil and plumbed up, the bottom was all over the place but I eventually settled on three lines, 8.5 metres (which as it’s quite narrow put me two thirds of the way across), in front of peg 1’s pallet (it wasn’t occupied obviously!) and an inside line at top two plus one, angled slightly to my left. On the side tray were just some 4mm Bait-Tech Xpands plus some micros that I’d soaked yesterday with Liquid Plum added to the water. Adie got us underway and I cupped in some micros on all three lines before starting at 8.5 metres straight out, I was slightly surprised not to have an indication quite quickly as there are quite a few hand sized skimbobs in Sellicks and after 15 minutes I was still biteless. Chris had landed a couple of carp from tight across and there were quite a few moving about along the far bank and down past peg 1. I switched to my second line by the pallet and missed a couple of bites before getting off the mark with a nice skimmers around 6oz or so. Things got even better when my next fish was a small tench about the same size but I then foulhooked a carp which thankfully wasn’t on long and it was time to swap lines again. 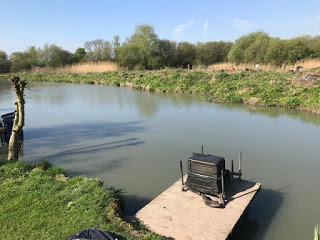 I had another small tench, this time from 8.5 metres and although I wasn’t bagging, it was a steady start, Jeff had only had a small tench and few little roach and I hadn’t seen Janders catch yet so I felt I was doing okay. I was dripping a few micros in on the short line every time I shipped out but wanted to leave it as long as possible. At the start of the second hour I was back down by the pallet and hooked a fish which I was sure was a tench but turned out to be a small 8oz carp and this signalled a bad patch where I landed a couple of small carp and had another go round a branch and snap me up. Thankfully my next bite was a little tench and then I had a decent 12oz skimmer to finish the second hour on a high to put me on around 2.5lb which I still thought wouldn’t be too far off the pace. But then, out of the blue, the wind got up, turned around and it got really cold quickly and my bites just stopped and looking up the pond so had everybody else’s, Chris was still hooking the odd carp but quite a few were coming off and I think the majority were foul hooked. I had to put my hoody on and it was a case of battening down the hatches as at times the wind was making it difficult to hold the pole! The anglers on the far bank seemed to be missing the worst of it with the wind off their backs and most of them still seemed to be catching carp quite well. After about an hour where I haven’t had a bite and the only action was a foul hooked carp which took me all round my swim (and Chris’s) before going under the pallet in peg one and transferring the hook to one on the legs, I had to get off my box to retrieve the rig (much to the Tart’s amusement!). I was freezing cold and had to put on my coat along with my bib and brace and I was still cold! Janders wandered down and he’d only had one skimmer and wasn’t enjoying himself too much either. For the remainder of the match if the float went under on any of my lines, it was a carp and it looked like Jeff was in the same boat and it was almost funny (or it would have been if I’d hadn’t been shivering so much!). Janders packed up early and I was looking forward to hearing the final whistle when, with a couple of minutes to go, the float sunk from view and I hooked a fish which didn’t feel like a carp and this time it wasn’t as a crucian around a pound popped up, as I unhooked it Adie blew the whistle to put an end to proceedings. I ended up with three little tench, two skimmers plus that crucian and around ten nuisance carp. After packing up, the scales started with me and my meagre catch of silvers went 3lb 7oz and my carp weighed 22lb 10oz, Chris had 47lb 9oz and then Jeff’s silvers weighed 1lb 14oz which just shows you how hard it had been. 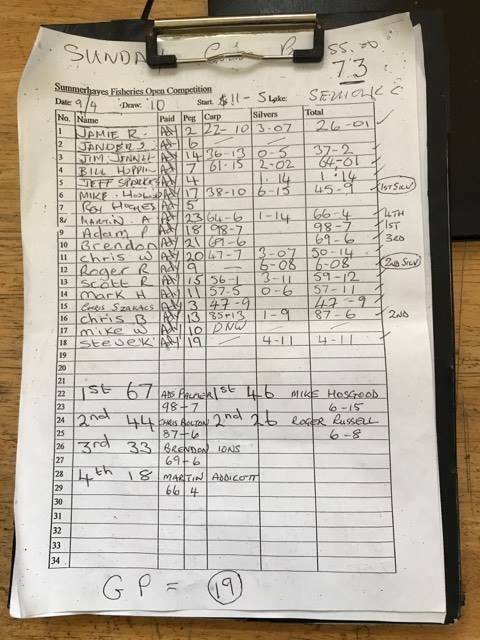 Roy Hughes in 5 and Janders in 6 didn’t weigh so at least I was a pound up, Bill ‘The Paste King’ Hopping on peg 7 had 64lb 1oz before Roger Russell went into the silvers lead with 6lb 8oz from peg 9, Mark Hanham had 57lb 11oz from peg 11 before Chris Boulton plonked 87lb 6oz on the scales from peg 13. Scotty Russell had 59lb 12oz from peg 15 and then Exeter Mike had 6lb 15oz of silvers from peg 17. Ads Palmer was next and after three weighs, his total was 98lb 7oz (photo courtesy of Adam Palmer). Steve Kedge had fished for silvers all day but had struggled for 4lb 11oz so the golden peg was safe, Chris W had 50lb 14oz from peg 20 and then the Tart went into third place with 69lb 9oz from peg 21 but as he didn’t have any silvers we finished all square on the side bets. 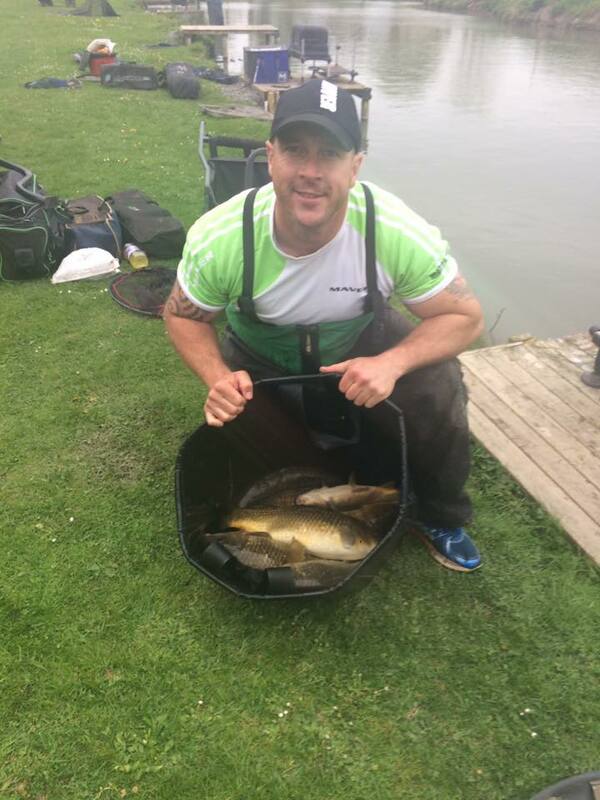 Last to weigh was Martin Addicot with 66lb 4oz from peg 23 which saw him finish fourth and take the final frame place. So a really disappointing day for me, definitely one to forget and the silvers certainly didn’t want to play ball in those early pegs and the top four and the silvers winner all came from the top end or far side.